PROOF: I, 24 News Stations, Obama and Congress have all jump on the Twitter bandwagon. Stumble: the chance for someone to see what you put out there. Sticky: the chance that the same user will stay around or input info. "The latest numbers from Nielsen Online indicate that Twitter grew 1,382% year-over-year in February, registering a total of just more than 7 million unique visitors in the US for the month. 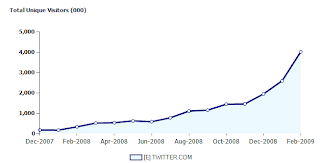 Not only is that huge growth in one year, but in one month as well, as in January, Twitter.com clocked in with 4.5 million unique visitors in the US, meaning the service grew by more than 50 percent month-over-month." If there is only one user adding one more, a simgle user, is a 100% growth rate. Does not mean there are lots of people using it. Only 26% of online Canadians knew of Twitter and only 1% of all Canadians use Twitter. Judging by this poll Twitter is clearly more buzz than twit. Still, like firearms, actual users really do like it. Canadians are traditionally slow to adopt new technology. Look at Cell phone adoption rates. We are stunted at between 50-60% adoption while Europe, Asia and the USA push 70-95%.